J.P. Grimes, The Role of Plasticity in Exploiting Environmental Heterogeneity. D. Baldocchi, The Physical Nature of Solar Radiation in Heterogeneous Canopies: Spatial and Temporal Attributes. C.L. Ballare, Light Gaps: Sensing the Light Opportunities in Highly Dynamic Canopy Environments. M. Kuppers, Light Gaps: Rapidly Filling Space and Intercepting Light-A Whole-Plant Perspective. D.J. Sims and R.W. Pearcy, Photosynthetic Acclimation to Varying Light: A Leaf to Whole-Plant Perspective. R.W. Pearcy, R.L. Chazcon, and K.A. Mott, Photosynthetic Utilization of Light Variations on the Time Scale of Seconds to Minutes. C. Vazquez-Yanes, Signals for Seeds to Rapidly Sense and Respond Rapidly to Light Gaps. G.P. Robertons and K.L. Gross, Assessing the Heterogeneity of Belowground Resources: Quantifying Pattern and Scale. J. Stark, Causes of Soil Nutrient Heterogeneity. P.S. Nobel, Root-soil Response to Water Pulses in Dry Environments. A.H. Fitter, Architecture and Biomass Allocation as Components of the Plastic Response of Root Systems to Soil Heterogeneity. M. Caldwell, Exploiting Nutrients in Fertile Soil Microsites. F.A. Bazzaz, Coping with Multiple Environmental Gradients in Gaps. G. Bell and M.J. Lechowicz, Spatial Heterogeneity at Small Scales and How Plants Respond to It. There is a new emerging interest in the effects of gaps and patches on succession and biodiversity. 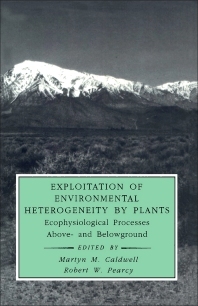 This innovative volume is a synthesis of studies of plant responses to temporal and spatial heterogeneity, the exploitation of resources from pulses and patches by plants, and their competition with neighbors in the face of this variability. Aboveground, the book focuses upon the nature of canopy patchiness, consequences of this heterogeneity for the light environment, and the mechanisms by which plants respond to and exploit this patchiness. Belowground, the text explores the heterogeneity of soil environments and how root systems obtain nutrients and water in the context of this temporal and spatial variability. As a new reference in an evolving and growing field, this text is sure to be a valuable tool for researchers and advanced students in plant physiology, ecology, agronomy, and forestry alike. Utah State University, Logan, U.S.A. The Royal Meteorological Society, U.K.